As part of the Fifeville neighborhood, Buford Middle School serves all 7th and 8th grade students in the City. Located at 617 9th St., SW, Buford School has extensive flowerbeds, including a memorial garden that is maintained by staff and students. Adjacent to the school is the Smith Recreation Center, which features an indoor pool. For more information about the recreation center, call (434) 977-1960. One of six elementary schools serving K - 4th grade, Burnley-Moran is located at 1300 Long Street in the Locust Avenue neighborhood. Burnley-Moran has age-appropriate playgrounds, as well as large playing fields that are used extensively by neighbors after school hours. Charlottesville High School (CHS) serves the public school students of Charlottesville from 9th to 12th grade. It is located at 1400 Melbourne Road, in the Greenbrier neighborhood. The grounds include memorial gardens, a running track, ballfields, landscaped courtyards and the Charlottesville Performing Arts Center. CHS is one of seven case studies in the 1998 publication The City As a Park, A Citizens' Guide to Charlottesville Parks, which is available for purchase from the Parks and Grounds Division. Located in the historic neighborhood of Belmont at 1000 Belmont Avenue, Clark School has recently begun renovations of its grounds. Among the prominent features of the school landscape is a very large and lovely American Elm tree, located at the top of the stairs that face onto Monticello Avenue. Prized as street trees throughout the eastern United States, the American Elm graced our city streets until Dutch Elm disease wiped out virtually all of the trees by the mid-1970's. Be sure to look for the tree when you are in the neighborhood. 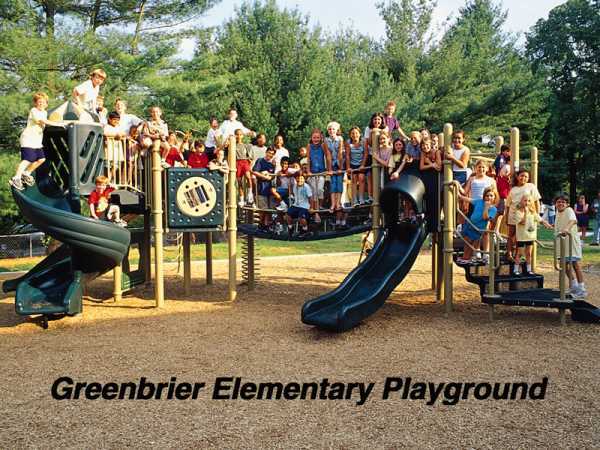 Greenbrier School is one of seven case studies in the 1998 publication The City As a Park, A Citizens' Guide to Charlottesville Parks, which is available for purchase from the Parks and Grounds Division. Jackson-Via Elementary School is located at 508 Harris Road, in the Fry Springs neighborhood. Jackson-Via has extensive playground equipment, as well as a lovely nature trail that loops through the small urban forest at the back of the property. Recently renovated by volunteers, the trail includes a nice cross-sample of trees, and is a good example of a succession in a forest. Jefferson Preschool serves preschool students from throughout the city. Located at 201 4th St., NW, the preschool is housed in a building rich in history. During the days of segregation, Jefferson School was the first school for African-Americans in Charlottesville (1928 photo), and was known as the Jefferson Graded School. Benjamin Tonsler, for whom Tonsler Park is named, was principal of the school for almost 30 years. In recent years the school has been adapted for different uses, including the Carver Recreation Center. The school grounds feature a large, colorful mural along the playground wall, and playground equipment suitable for preschool children. Situated in Johnson Village, the grounds of Johnson Elementary School have many interesting features. These include an outdoor amphitheater, a large playing field, large shade trees, and an "English garden" that has boxwoods, dogwoods and crepe myrtles. Venable Elementary School is a welcome oasis of green space and gardens in a very urban neighborhood. Located at 406 14th Street, NW, Venable staff and students have a variety of spaces that they maintain, including the Nancy B. Newman habitat garden which is designed to attract birds, butterflies and other "critters"; the "Monticello" garden and numerous classroom gardens that are in raised beds. Students plant and grow everything from beans to zinnias, as well as playing on two playgrounds (one for K - 2nd grade, and one for 3rd to 4th grade students) and a large playing field on the lower level. Venable is one of seven case studies in the 1998 publication The City As a Park, A Citizens' Guide to Charlottesville Parks, which is available for purchase from the Parks and Grounds Division. Walker School serves the 5th and 6th grade public school students in Charlottesville. Located in the Greenleaf neighborhood at 1564 Dairy Road, Walker has a fitness trail, playing field, basketball courts and a nature trail that winds from behind the Crow Recreation Center all the way to neighboring Greenleaf Park. The trail was renovated in the summer of 2000 by the APO fraternity of UVa, who mulched, pruned, weeded flower beds and built a new footbridge across the stream.